“Assisted Living Facilities” require residents to pay for services they may not need. Most people only need a select few services to help them with their daily activities. The Assisted Living Model is expensive and unnecessary for most people. It is a one-size-fits-all approach to living that usually comes with rigid payment structures. 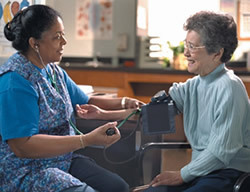 The Tailored Care System is a smart alternative to an Assisted Living Facility. Members of The Village at Redlands work directly with our partnered healthcare professionals to design their own Tailored Care Plan. As part of our Resident-Centered Philosophy, we’ve made The Tailored Care System flexible and adaptable. It grows with our members as their needs change. Most importantly, our members choose the services they need, and pay for only the services they choose making The Tailored Care System the most affordable and effective way to plan for current and future needs.